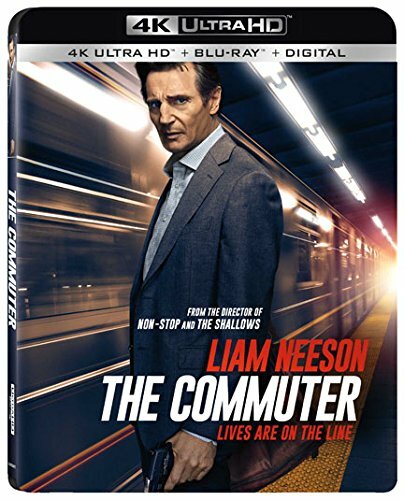 The Commuter is the fourth collaboration between Director Jaume Collet-Serra and Liam Neeson and although you might call it Non-Stop but on a train, it is entertaining enough to make you forget about the similarities between the two. It is a perfect movie to shut your brain off to and enjoy. 60 year-old Michael MacCouley (Liam Neeson), an ex-cop, is a family man who commutes daily to his job as a life insurance salesman. On one of his routinely commutes a woman named Joanna (Vera Farmiga) approaches him and asks him to identify a passenger in the train known simply as “Prynne.” The faith of the passenger will be unknown to Michael but he would get a total of $100,000 ($25,000 hidden in the restroom and $75,000 after the job is done) for simply putting a GPS on Prynne. Having just been fired from his job with just 5 years away from retirement, this offer seems perfect. Before quickly leaving, Joanna tells Michael he has until the “Cold Springs” stop to find this passenger. Doubtful, Michael goes into the restroom and finds the $25,000 mentioned by Joanna. He tries to leave the train but a random person gives him an envelope with his wife’s wedding ring in it. Unbeknownst to Michael, by picking up the money he has just accepted the job. He sneakily asks Walt (Jonathan Banks), a regular on the train, to inform the cops but he soon realizes that Joanna has control of the whole situation and Walt does not make it to the cops. He travels back and forth in the train trying to identify the passengers he does not recognize and plants the GPS on a suspicious person. He calls his former partner Detective Lieutenant Alex “Murph” Murphy (Patrick Wilson) to tell him everything. Michael learns that Prynne was a witness in a murder that was labeled as a suicide which leads him to realize that Prynne will be killed. Upon deciding to not give Prynne’s identity, Joanna says not only every passenger is now in the danger, but also his family who he has not been able to get a hold of. Michael uses his skills as a cop to try to save his family and everyone on the train. The Commuter is definitely better than I expected. I was caught off guard by the great editing at the beginning which shows – instead of telling – Michael’s daily routine without being repetitive. In fact, I wanted to see more of it as I was quickly immersed into Michael’s life. Props to Director Jaume Collet-Serra (Unknown, Non-Stop, Run All Night) for showing more about a character in the first 5 minutes than a lot of movies do in an hour. Like most of Liam Neeson’s films though, that is the only unique section of this movie. Not that that’s a bad thing, this is still a fun movie. It is your typical popcorn-action movie that is entertaining enough for you to forget about plausibility and just be entertained with the images on the screen (even if the twist at the end could be seen from miles away – no pun intended). At 65 years-old, Liam Neeson is still fun to watch in action roles. Watching him put the puzzle pieces together is thrilling and the fight sequences are enjoyable. Like many recent movies, there is a fight scene made to look like a one-shot take. Although some cuts are obvious, the fight is great especially considering the condensed space in the train. That being said, Patrick Wilson’s character seems underdeveloped. Aside from not getting enough screen time, his actions seemed forced and cliché. At almost 2 hours, the movie does not overstay its welcome. A few extra minutes would have made it feel too long, though. For a movie that takes place entirely in a train, I did not find myself bored. The Commuter was shot with the Alexa mini and completed as a 4K digital intermediate. This 4k UHD Blu-Ray contains the film in a 2160p with HDR10 and a 2.39:1 aspect ratio. I did not expect this movie to look at as good as it did. Compare to the regular 1080p Blu-Ray there are noticiable differences. The facial expressions pop out more. The sweat on the characters faces is a lot more noticeable which makes you feel the heat caused by the lack of AC in some cabins. The textures on the train seats are also more defined; The detail when the sun shines on them looks amazing. Although the movie does not have a lot of color, the HDR stands out in the contrast. There a lot of scenes where Michael is shadowed by an object but that never obstructed my view, in fact, it made the scenes stand out more and it created juxtaposition between characters. The sharper images do make the CGI stand out more, though. Green screen scenes are a lot more noticiable, most of them take place when Michael is outside the train, and (spoilers) the derailing at the end was not convincing. The scene seemed animated and it did take me out for a couple seconds which kept me from giving this section at a score no higher than a 4 (that is still impressive). Although both the regular Blu-Ray and the UHD come with a Dolby Atmos track (with TrueHD 7.1 core), watching the UHD version is the better choice since, as mentioned above, the video quality is impressive and both combine help with the immersion. Random noises like background sounds, conversations between passengers and the noises from the train make the movie feel more alive. When Michael switches from one cabin to another (which he does a lot throughout the film) the sudden sounds from outside makes you feel as you are the one stepping out. The height speakers take advantage of the fight sequences as the objects being used and punches offer a clear overhead placement. As expected, the LFE is strong but not overused. The derailing scene mentioned above sounds amazing. The explosions, the train railing on its track, and the pieces flying around filled every single corner of the living room. Every detailed was heard and nothing was too loud for the sake of being loud. The audio is what helped the scene seemed more believable as the CGI was noticiable. All of the special features can be found on the included 1080p Blu-ray version of the film (Not that there is that many). End of the Line (1080p; 9:15): Interviews with the cast and director and some behind the scenes footage. Off the Rails (1080p; 4:18): Not so much different from “End of the Line” but it does focused more on the challenges faced by the crew while shooting in a small space. The Commuter may not be a movie with a intriguing/complex plot and although it has some clichés, it is still worth a watch.